The Rev. Franklin Graham is quitting the Republican Party as he begins a series of rallies in every state capital to urge voter support for candidates who hold "Biblical values." Why did he quit the Republican Party? "Shame on the Republicans and the Democrats for passing such a wasteful spending bill last week" he said on his Facebook page. "And to top it off, funding Planned Parenthood." The liberal Huffington Post called it a "big win for Planned Parenthood." Graham called it "a big loss for America. After all of the appalling facts revealed this year about Planned Parenthood, our representatives in Washington had a chance to put a stop to this, but they didn’t." 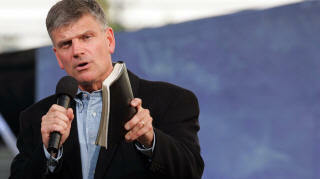 Graham asserted, "There’s no question – taxpayers should not be paying for abortions! Abortion is murder in God’s eyes. Seeing and hearing Planned Parenthood talk nonchalantly about selling baby parts from aborted fetuses with utter disregard for human life is reminiscent of Joseph Mengele and the Nazi concentration camps! "That should have been all that was needed to turn off their faucet," asserted Graham, the son of Billy Graham who runs Samaritan’s Purse, a disaster relief agency, which provides $375 million of help annually to those in need – most recently those hit by tornados in Texas. It is best known for sending 124 million shoeboxes of gifts for kids in poor countries at Christmas. I was shocked that Planned Parenthood was funded by Congress. Both the Republican House and Senate passed bills to defund the agency which received $554 million of taxpayer funds in fiscal 2014, a $25 million increase from 2013. Yet the $1.1 trillion dollar omnibus funding bill refunded PP – despite legislation to halt its funding. Furthermore, the number of patients visiting Planned Parenthood clinics dropped from 3 million in 2012 to 2.5 million in 2014 – as federal funding was increasing! Jim Sedlak, vice president of the American Life League, called it "absolutely incredible that Planned Parenthood continues to get more and more taxpayer dollars while its customer base and services provided plummets." "An 11 percent decrease in services and a record low number of clients are very significant, yet Congress recently passed a budget for 2016 keeping Planned Parenthood fully funded. It is time this stopped." Planned Parenthood performed 323,999 abortions in 2014 – making it by far the largest abortion provider in the country. That figure is down slightly from 327,653 in 2013. The odds are that figure will drop much more substantially in 2015, when there was so much negative PP publicity. The number of PP clinics fell from 668 to 645, although 16 new facilities were opened. Rev. Graham said the failure of Congress to trim the 2,000-page $1.1 trillion budget "is an example of why I have resigned from the Republican Party and declared myself Independent. I have no hope in the Republican Party, The Democratic Party or Tea Party to do what is best for America." He suggests a bold new strategy to reverse America’s declining fortunes: "Unless more godly men and women get in this process and change this wicked system, our country is in for trouble. "I want to challenge Christians -- even pastors -- across this country to pray about running for office where they can have an impact. We need mayors, county commissioners, city council members, school board members -- who will uphold biblical values." Graham will offer his impressive vision to recruit Christians to run for public office starting on January 5 on the steps of the State Capitol in Des Moines, Iowa. Most of the rallies with dates announced so far are timed to influence voters just ahead of their state’s presidential primary -- in New Hampshire and South Carolina after Iowa, for example. "God hears the prayers of his people, so I’m calling on people of faith in every state to pray fervently for America and our leaders." This is a brilliant strategy. Obviously, people are paying the greatest attention to politics in the days before a primary or an election. Graham’s speeches a month before the Iowa caucuses and subsequent primaries will garner maximum public attention. Recently he wrote on his Facebook page, "I want to challenge Christians across our land to boldly live out and promote biblical principles at home, in public and at the ballot box. The only hope for this country is if the people of God are willing to take a stand for truth and righteousness." That is a noble goal and a fresh vision of what it means to be an American Christian. Copyright (c)2015 Michael J. McManus is President of Marriage Savers and a syndicated columnist.